We're excited to welcome Justin Furstenfeld to Common Grounds as part of his open book tour. 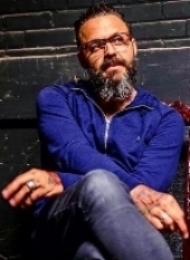 You may recognize Justin's voice from the band, Blue October. Justin is best known for the emotional and deeply felt lyrics that so many connect with. This show will be part of an open book tour. On this tour, Justin has promised to be raw, emotional and interactive. With influences: like Peter Gabriel, Blue Miller, George Winston, Jean-Michel Basquiat and U2, Justin has created music that has connected with listeners all over the world, especially those who deal with depression and suicidal thoughts.